View of the John F. Kennedy Center for the Performing Arts from across the Potomac. The John F. Kennedy Center for the Performing Arts (identified on the building itself as the John F. Kennedy Memorial Center for the Performing Arts and also commonly referred to as the Kennedy Center), located on the Potomac River in Washington, D.C. opened in 1971, the culmination of almost 40 years of planning, campaigning, and fundraising. The center, the first federally funded performing arts institution in the United States, represents a unique public-private partnership. It is both the nation's living memorial to President John F. Kennedy and the United States' national center for the performing arts. Programs include educational and outreach initiatives, supported almost entirely through ticket sales and gifts from individuals, corporations, and private foundations. Designed by famed New York architect Edward Durell Stone, the Kennedy Center includes three main stages, the Opera House, Concert Hall, and Eisenhower Theater as well as a number of smaller stages. It provides a world class venue for performances of all kinds for patrons in the Washington, D.C. area. The Kennedy Center is one of the three most important venues in the United States, along with Lincoln Center in New York City and The Los Angeles Music Center, and is a major tour stop for visiting overseas opera, dance and drama companies. Although the majority of programming costs are paid for by ticket sales and private contributions, the Kennedy Center receives federal funding each year to pay for the maintenance and operation of the building. The outside of the Hall of Nations, where there is one flag for every nation. The idea for creating the Kennedy Center dates back to 1933, when First Lady Eleanor Roosevelt discussed ideas for the Emergency Relief and Civil Works Administration to create employment for unemployed actors during the Great Depression. In 1935, Congress held hearings on plans to establish a new Department of Science, Art, and Literature and to build a monumental theater and arts building on Capitol Hill near the Supreme Court building. 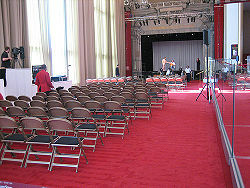 A small auditorium was added at the Library of Congress, but it had restrictions on its use. A congressional resolution, in 1938, called for construction of a "public building which shall be known as the National Cultural Center" near Judiciary Square, but nothing materialized. In 1950, the idea for a national theater resurfaced when U.S. Representative Arthur George Klein of New York introduced a bill to authorize funds to plan and build a cultural center as a memorial to President Franklin D. Roosevelt. The bill included provisions that the center would prohibit any discrimination of cast or audience. From 1955 to 1958, the idea was debated in Congress, amidst much controversy. In the summer of 1958, a bill was finally passed in Congress and on September 4, 1958, President Dwight D. Eisenhower signed into law the National Cultural Center Act which provided momentum for the project. This was the first time in history that the United States federal government helped finance a structure dedicated to the performing arts. The legislation required a portion of the costs, estimated at $10-25 million, to be raised within five years of passage of the bill. Edward Durell Stone was selected as architect for the project in June 1959. He presented preliminary designs to the President's Music Committee in October 1959, along with estimated costs of $50 million, double the original estimates of $25-30 million. By November 1959, estimated costs had escalated to $61 million. Despite this, Stone's design was well-received in editorials in The Washington Post and the Washington Star, and quickly approved by the United States Commission of Fine Arts, National Capital Planning Commission, and the National Park Service. Because the National Cultural Center Act stated that the institution was to be self-sustaining and privately funded, a massive fundraising campaign began immediately. Fundraising was led by the National Cultural Center Board of Trustees, which was set-up by Eisenhower on January 29, 1959. Fundraising efforts were not successful, with only $13,425 raised in the first three years. President John F. Kennedy was interested in bringing culture to the nation's capital, and provided leadership and support for the project, greatly encouraging and aiding the fundraising aspect of the project. In 1961, President Kennedy asked Roger L. Stevens to help develop the National Cultural Center, and serve as chairman of the Board of Trustees. Stevens recruited First Lady Jacqueline Kennedy as Honorary Chairman of the Center, and former First Lady Mamie Eisenhower as co-chairman. 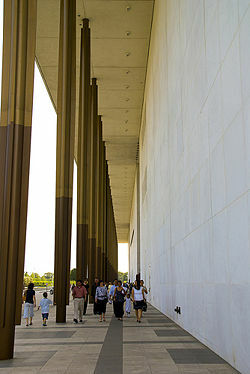 The National Cultural Center was renamed as the Kennedy Center in 1964, following the assassination of President Kennedy, in large part in gratitude for Kennedy's support. The total cost of construction ended up around $70 million. Congress allocated $43 million for construction costs, including $23 million as an outright grant and the other $20 million in bonds. Funding was also provided through donations, including $5 million from the Ford Foundation, and approximately $500,000 from the Kennedy family. 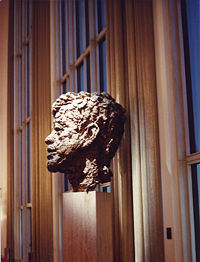 Eight foot high bronze bust of President John F. Kennedy, who was so vital to the construction of the Kennedy Center, on display in the lobby of the center. Other major donors included J. Willard Marriott, Marjorie Merriweather Post, John D. Rockefeller III, and Robert W. Woodruff, as well as many corporate donors. Gifts were also provided to the Kennedy Center from foreign countries, including a gift of 3,700 tons of Italian Carrara marble worth $1.5 million from the government of Italy, which was used in the building's construction. The work of the Natural Cultural Center Board did not finish with the center's opening; funding is still required on an ongoing basis. In 1988, newly appointed chairman Ralph P. Davidson helped secure an ongoing Japanese endowment that helps the Kennedy Center operate from year to year. President Lyndon B. Johnson was present when ground was broken for the Kennedy Center on December 2, 1964, though debate continued for another year over the Foggy Bottom site which had been chosen as the center's home, with some advocating for another location on Pennsylvania Avenue. Excavation of the site finally got underway on December 11, 1965, and the site was cleared by January 1967. Four years later, construction was complete, and the first performance was on September 5, 1971, with 2,200 members of the general public in attendance to see a premiere of Leonard Bernstein's Mass in the Opera House, while the Center's official opening took place over a period of three days, beginning with a formal gala and premiere performance of the Bernstein Mass in the Opera House in September 8, 1971, and continuing the following two days with a performance by the National Symphony Orchestra conducted by Antal Dorati in the Concert Hall and the debut of Alberto Ginastera's opera, Beatrix Cenci in the Opera House. The Kennedy Center was designed by architect Edward Durell Stone, known for his designs for Radio City Music Hall and the Museum of Modern Art (designed in collaboration with Philip S. Goodwin) in New York, created in the 1930s, and for dozens of buildings throughout the eastern United States in the intervening decades. Stone designed a dignified classic structure for the Kennedy Center, with a striking roof overhang adding distinction to its long low profile. A sidewalk at the Kennedy Center, majestically flanked by the center's tall, slender pillars. Overall, the building is 100 feet (30 m) high, 630 feet (190 m) long, and 300 feet (91 m) wide. The center features a 600-foot (180 m) long, 63-foot (19 m) high grand foyer, with 18 massive crystal chandeliers and red carpeting. The Hall of States and the Hall of Nations, 250-foot (76 m) long, 63-foot (19 m) high corridors, run the width of the bulding between the three main venues. The building has drawn criticism for its location (far away from Washington Metro stops), and for its scale and form, although it has also drawn praise for its acoustics and its terrace overlooking the Potomac River. Cyril M. Harris designed the Kennedy Center's auditoriums and their acoustics. A key consideration is that many aircraft fly along the Potomac River and overhead the Kennedy Center, as they take off and land at the nearby Ronald Reagan Washington National Airport. Helicopter traffic over the Kennedy Center is also fairly high. To keep out this noise, the Kennedy Center was designed as a box within a box, giving each auditorium an extra outer shell. The three main theaters at the Kennedy Center are the Opera House, the Concert Hall, and the Eisenhower Theater. The Opera House, located in the center of the building, has 2,318 seats. Its interior is adorned with red velvet, and the stage has a distinctive red and gold silk curtain main curtain, which was a gift from Japan. The Opera House also features a Lobmeyr crystal chandelier, also a gift, this time from Austria. It is the major opera, ballet, and large-scale musical venue of the Center, and was closed during the 2003/2004 season for extensive renovations which provided a revised seating arrangement and re-designed entrances for the orchestra level of the auditorium. The Opera House is the home of the Washington National Opera and the annual Kennedy Center Honors. The Concert Hall, on the south side of the center, seating 2,518, is the largest performance space in the Kennedy Center. Behind the stage is located a 4,144-pipe organ, a gift from the Filene Foundation of Boston. When it opened in 1971, the Concert Hall had a seating arrangement similar to that used in many European halls such as Musikverein in Vienna. The Concert Hall was renovated in 1997, with the addition of a high-tech acoustical canopy, and wheelchair accessible locations on every level, and new seating sections (onstage boxes, chorister seats, and parterre seats). The Hadelands crystal chandeliers, a gift from Norway, were repositioned to provide a clearer view. The Concert Hall is the home of the U.S. National Symphony Orchestra. The Eisenhower Theater, on the center's north side, seats 1,142 and is named for President Dwight D. Eisenhower, honoring his contributions to the original legislation that led up to the theater's construction. Hosting plays and musicals, smaller-scale operas, ballet, and contemporary dance, the theater contains an orchestra pit that seats 40 musicians and is convertible to a forestage or additional seating space. The walls of the theater are of East Indian laurel wood. The red and black stage curtain of hand-woven wool was a gift from Canada. The theater was closed for renovations for parts of 2007 and 2008. Preparing for a performance on a small stage. The Family Theater, located off the Hall of States, opened in 2005, replacing what was once the American Film Institute Film Theater. With 324 seats, the new Family Theater provides a home for world-class family theater performances for the nation's youth and continues the Kennedy Center's $125 million commitment to performing arts education for adults and children alike. Designed by the architectural firm Richter Cornbrooks Gribble, Inc. of Baltimore, the new theater incorporates the most modern theatrical innovations available, new audio, computerized rigging and digital projection systems. The Terrace Theater, with 513 seats, was constructed on the roof terrace level in the late 1970s, as a Bicentennial gift from the people of Japan to the United States. It is used for intimate performances of chamber music, ballet, contemporary dance, and theater. The Theater Lab, with 399 seats plus cabaret-style tables has been the site of an 18-year long run of the whodunit, Shear Madness. The Millennium Stage, part of the "Performing Arts for Everyone" program launched by then-Director James Johnson in the winter of 1997, provides free performances every evening at 6:00 p.m. on two specially created stages at either end of the Grand Foyer. A broad range of art forms are featured on the Millennium Stage. These include performing artists and groups from all 50 states and an Artist-in-Residence program featuring artists performing several evenings in a month. Every show on the Millennium Stage is available as a simulcast of the live show and is archived for later viewing via the Kennedy Center's website. The KC Jazz Club. On March 12, 2003, the space formerly known as the Education Resource Center was officially designated the Terrace Gallery, and is now home to the Kennedy Center Jazz Club. 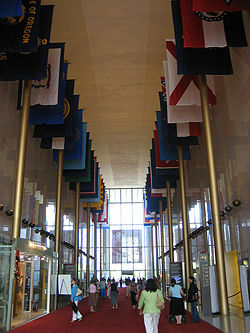 The Hall of States, between the Eisenhower Theater and the Opera House, displays a flag for each US state. Since 1978, the Kennedy Center Honors have been awarded annually by the Center's Board of Trustees. Each year, five artists or groups are honored for their lifetime contributions to American culture and the performing arts, including dance, music, theater, opera, film, and television. The Center has awarded the Mark Twain Prize for American Humor since 1998. During the American Bicentennial, numerous special events were held at the Kennedy Center throughout 1976, including six commissioned plays. Free performances by groups from each state were also held at the Kennedy Center. The Kennedy Center also hosts special inauguration events and galas. Since its opening, the the Opera House has hosted a number of important productions, including Mikhail Baryshnikov's version of The Nutcracker ballet for two weeks in 1976, George Bernard Shaw's Caesar and Cleopatra with Rex Harrison and Elizabeth Ashley. The American Ballet Theater and the Kirov Ballet also frequently perform at the Kennedy Center. On June 16, 1971, Congress authorized appropriations for one year to the Board of Trustees for operating and maintenance expenses. In following years, the appropriations were provided to the National Park Service for operations, maintenance, security, safety, and other functions not directly related to the performing arts functions. The National Park Service and the Kennedy Center signed a cooperative agreement requiring each party to pay a portion of the operating and maintenance costs based on what proportion of time the building was to be used for performing arts functions. The agreement did not specify who was responsible for long-term capital improvement projects at the Kennedy Center, along with only periodic funding by Congress for one-time projects, the condition of the facility had deteriorated by 1990. Michael Kaiser, came to the Center in 2001 to take up the post of President of the Kennedy Center after successfully improving the finances of the Royal Opera House Covent Garden in London, and American Ballet Theatre. 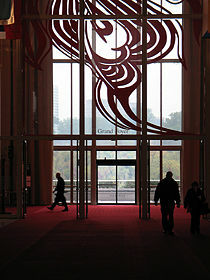 While overseeing the artistic activities at the Kennedy Center, has increased the Center’s already broad educational efforts, established cross-disciplinary programming with opera, symphony and dance, established an Institute for Arts Management, and created theater festivals celebrating the works of Stephen Sondheim and Tennessee Williams, and arranged for continuing visits by Saint Petersburg’s Mariinsky Theater Opera, Ballet, and Orchestra, and the Royal Shakespeare Company. ↑ 1.0 1.1 1.2 1.3 1.4 1.5 1.6 Roger Meersman, "The Kennedy Center: From Dream to Reality," Records of the Columbia Historical Society (1980):50. ↑ 2.0 2.1 Christopher Lydon, "Kennedy Arts Center Primps for Opening and Hopes to Make Profit," The New York Times September 6, 1971. ↑ 3.0 3.1 3.2 Nan C. Robertson, "At Last, the Performances Begin," The New York Times September 6, 1971. ↑ 4.0 4.1 John F. Kennedy Center for the Performing Arts, History of the Living Memorial. Retrieved August 11, 2008. ↑ 5.0 5.1 5.2 5.3 New York Times, "$3-Million in Gifts Adorn Center," September 6, 1971. ↑ Weeks, Christopher. AIA guide to the architecture of Washington, D.C. (Baltimore: Johns Hopkins University Press, 1994, ISBN 9780801847134). ↑ Leland M. Roth, A Concise History of American Architecture (Westview Press, 1982, ISBN 9780064300865), 337. ↑ Daniel R. Raichel, The Science and Applications of Acoustics (New York: Springer, 2000, ISBN 9780387989075), 252. ↑ Harold C. Schonberg, Kennedy Hall Gets Acoustics Workout, The New York Times September 2, 1971. ↑ Brooks Boliek, Kennedy nods to Douglas, Gould, The Hollywood Reporter September 8, 1994. ↑ General Accounting Office, Kennedy Center: Information on the Capital Improvement Program, GAO Report to Congress. Retrieved August 11, 2008. John F. Kennedy Center for the Performing Arts. John F. Kennedy Center for the Performing Arts. Washington, DC: Kennedy Center Press, 2000. OCLC: 45658773. Gill, Brenden. John F. Kennedy Center for the Performing Arts. New York: H.N. Abrams, 1981. ISBN 9780810922631. History of "John F. Kennedy Center for the Performing Arts"
This page was last modified on 15 May 2018, at 19:51.